A fourth-class pupil at Ballyraine National School in Letterkenny, is the lucky winner of the National Standards Authority of Ireland Robot Colouring Competition. 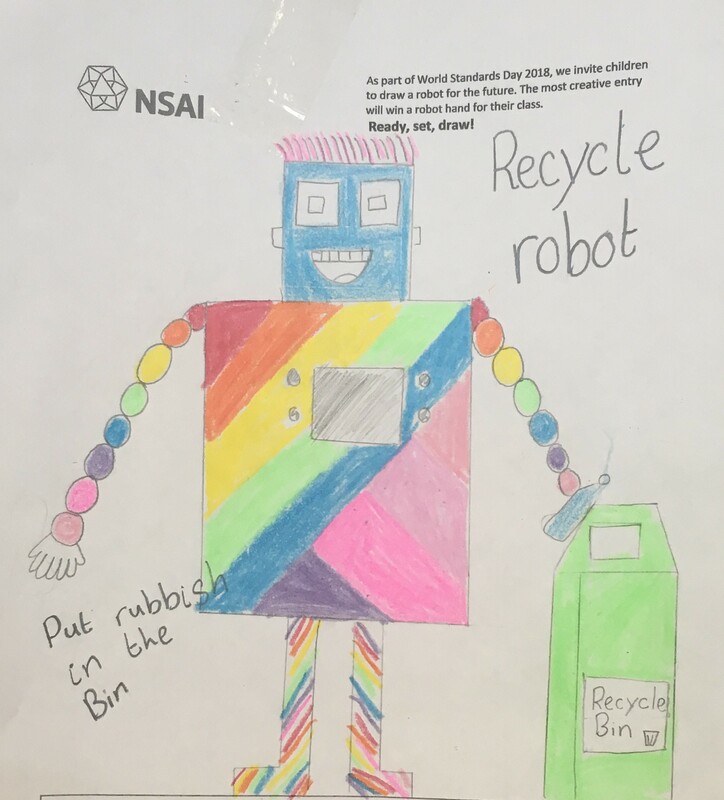 As part of World Standards Day 2018, pupils from all over Ireland were invited to draw a fun and friendly robot. The most creative entry would win a robot arm for their class at school. The winning entry composed of a colourful and happy robot with extra-long arms, that helped people recycle at home and at school. National Standards Authority of Ireland (NSAI) Director of Standards and Metrology, Enda McDonnell said he was delighted with the winning entry. “With over 296 entries, NSAI is happy to announce the winner from Ballyraine National School. A lot of creativity went into the winning design and it was great to see such focus on protecting the environment. We would like to thank everyone who entered our competition. NSAI were thrilled to such levels of engagement and we are always happy to engage with schools, whenever we can." David Oliver, Principal of Ballyraine National School, expressed delight in the school's success. "All the pupils in 4th Class had great fun creating their robot. The World Standards Day Children’s' Design competition is the perfect fusion of technology, innovation and creativity. The pupils in 4th Class were delighted with the news and are eagerly awaiting the delivery of their 'Robot Arm'. We would like to thank NSAI for providing us with this wonderful opportunity to explore technology of the future"
World Standards Day 2018 took place on October 14th. The theme of the celebration was “International Standards and the Fourth Industrial Revolution” which refers to new technology that is helping to transform society.